And so it begins! The biggest week in Fashion, NYFW. A time when some fashion lovers absolutely look forward to while some others loathe with a passion. We are only a few days away from Fashion week and I still don’t know if I am going. Talk about being indecisive, right? However, I have put together a look to inspire your Fashion week wardrobe, if you are going; or your Winter Style if you are celebrating from afar. It is freezing in NYC, so combining fashion and practically should be priority. I have no interest in frost bite or getting sick in the name of fashion anymore, that was 22 year old version of me. She may have been that crazy but I am not about that life anymore. Yeah, jigs up lol! This look comprises of a mixture of textures, a faux fur coat and a tweed dress that take center stage. However, highlighting the black and white color scheme through out the look pulls the entire ensemble together. It is grounded with my fave black and oh so comfy OTKs. I am in love with my Marc Fisher boots! They have been on heavy rotation this Winter and totally go with everything! Here’s a tip! NYFW is all about the coat! Grab a bold statement coat, paired with some badass boots and you are golden. 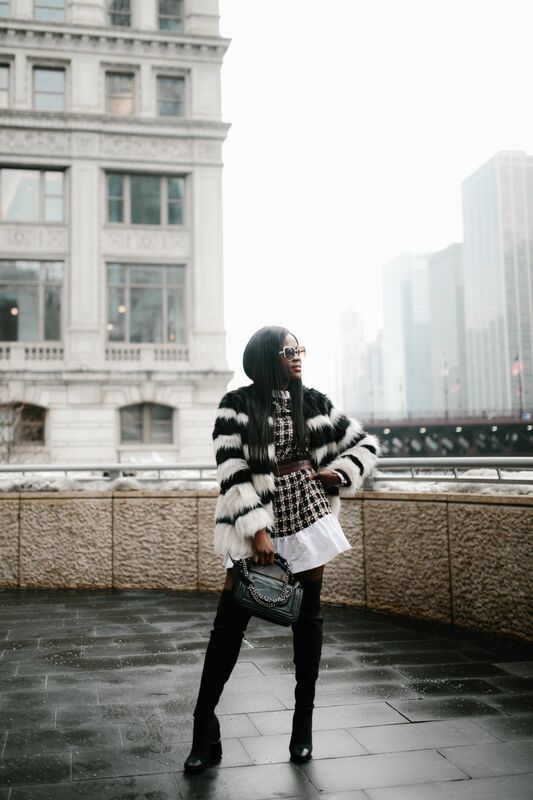 A belted coat is always in, so take your faves along with you! If you are going to NYFW this week and next, have the best time and stay chic! Ummm, and don’t get frostbite!